Col Henk Ras started his Air Force career in 1986 by attending the Royal Military Academy. When he graduated in 1990 he was posted at Control & Reporting Centre Nieuw Milligen to become a Fighter Controller. After a couple of years as an operational FC, he was an Instructor FC and chief of Weapons Instruction. In this operational timeframe he was also actively engaged as an NATO evaluator. In 1993 he acted as a E-3A AWACS liaison at CRC Veszprem in Hungary and in 1998 he was assigned as F-16 tasker at CAOC 5 in Vicenza, Italy. Between 1999 and 2002 he fulfilled two staff jobs at CRC NM and at the RNLAF Headquarters. From 2002 till 2006 he was posted as a Mission Commander at the NATO AWACS base in Geilenkirchen Germany. During the last 1,5 years of his GK tour he also fulfilled the position of Chief Mission Crew of SQ1. Thereafter he attended the Advanced Staff College in the Netherlands. From 2008 till 2011 he was assigned a staff job as Chief C4ISR requirements at the MOD in The Hague. Beginning 2011 he returned to AOCS Nieuw Milligen as the Chief of Staff / Deputy Commander. From sep 2012 until sep 2015 Col Ras was assigned Commanding Officer AOCS NM. 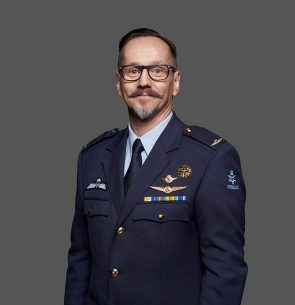 Currently he holds the position of Deputy Commander and Chief Of Staff of the Dutch Cyber Command.